With a 37-36 win over Ramapo, Demarest celebrated its its first state sectional title since 2004 and just the second in the history of its boys basketball program. FRANKLIN LAKES – It was two teams that value defensive effort over every other aspect of the game. It was a sold-out crowd plus a few more people crammed into the gym for a high-stakes game that would decide this year’s North 1, Group 3 state sectional champion. It was deafening and it went right down to the nub as top-seeded Ramapo hosted No. 3 Demarest in Franklin Lakes. The atmosphere was fitting for a trophy-hoister and maybe the only missing was offensive output, which left little margin for error and even less in terms of margin of victory. The teams combined for just 21 field goals in the game, for just 17 points in the middle two quarters and neither had more than a six-point lead in the second half. It was not pretty, but, boy…was it fun. Nick Argenziano hit both ends of a one-and-one with 1:01 to play to give Demarest a two-point lead, Joe Rotonde doubled that advantage from the foul with 16 ticks left and the Norseman held on through a wild chain of events in the waning seconds to close out a 37-36 win. 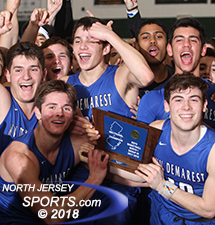 With that, Demarest won just its first state sectional title since 2004 and just the second in the history of its boys basketball program. 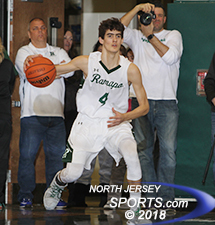 Sophomore Max Pernetti scored a team-high 9 points for Ramapo, including a three-pointer that tied the game with 1:11 left in the fourth quarter. Rotonde, who made the three-pointer that tied the game in the dying seconds of the third overtime against Wayne Hills on Friday night before Demarest won that semifinal game in the fourth extra session, came through when his team needed him most again. Both of his free throws with 16 seconds left fell right through the heart of the rim and he had to be pulled out of the celebratory scrum at midcourt created by the on-rushing travelling student section to do his postgame interview. After the an opening flurry that saw Demarest get out of the gate to the tune of a 9-2 lead and an early answer that saw Ramapo grab a 12-11 lead after the first quarter, the game turned into a possession by possession slog in which each and every shot was contested and each and every point scored was precious. How tough was the going offensively? After Rotonde made two free throws to give his team an 11-5 lead with 1:43 left in the first quarter, Demarest went the next 8:27 without scoring another point. Usually, a stretch like that would bury a team in a state sectional final, but in this one, when that drought finally ended with two more Rotonde free throws late in the second quarter, Demarest trailed by just three points and by just two, 16-13, at halftime. Joe Rotonde's two free throws with 16 second left gave Demarest the last points it needed. In a game in which no player from either team reached double figures in scoring, Demarest made just one third quarter field goal, an Endrit Kaleci three-pointer, and totaled just seven points, but it held Ramapo to just four in the period. Max Pernetti, the sophomore forward who finished tied for game-high honors with 9 points, scored inside to tie the game at 20 to end the third quarter before a head-scratching call gave Demarest the lead 36 seconds into the fourth. 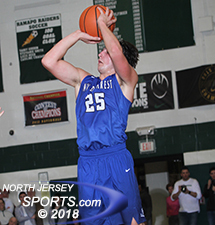 Zach Stimmel, Demarest’s senior point guard, went back door and scored on a reverse layup off an assists from Jake Runyon and there was a late whistle after the shot had gone in and while Ramapo was retrieving the ball to inbound it. The official ruled that Stimmel had been fouled after the completion of the play and, with Ramapo already over the foul limit in a tightly-called game from start to finish, Stimmel went to the foul line not just for an and-1, but for a one-and-one and he made both ends for a four-point trip that was worth its weight in gold in a contest so bereft of free -flowing offense. Free throws were difference as Demarest got to the line 21 times in the game and 15 times in the second half. The Norsemen were a combined 19 of 21 from the stripe, 14 of 15 in the second half and 10 of 11 in the fourth quarter, while Ramapo made just 5 of its 13 free throw attempts in the game and just 3 of 9 in the second half. With the game tied at 29, Ramapo missed three straight from the line, so when Stimmel scored on the baseline with 2:08 to go, it put Demarest ahead 31-29. A KC Hunt free throw and Pernetti’s three-pointer from the corner with 1:11 to go drew Ramapo even at 33-all. What could have been a disaster for Demarest when Stimmel was called for his fifth foul for pushing off while stuck in a trap in the backcourt turned out just fine for the Norsemen as his replacement, Argenziano, made his two one-and-one free throws with 1:01 to play. A Ramapo miss at the other end gave Demarest the ball back and that possession led to Rotonde’s two-clutch free throws. Trailing by four, Ramapo got a three-pointer from John Whooley that fell through the hoop with nine seconds left. Because Ramapo was out of timeouts and because high school rules state that the clock does not stop after a made basket even in the final two minutes, Demarest played it right by not even attempting to inbound the ball until there were under two seconds left and heaved over midcourt where Hunt intercepted it, and got off a heave that nearly went in. Whether it would have counted would have been another story, but it bounced off the back iron. And then the visiting crowd rushed the floor. TO BUY A COLLECTOR'S PRINT OF THIS STORY PLEASE VISIT 4-FeetGrafix.com. FOR MORE PHOTOS FROM THIS EVENT CLICK HERE!